Yes, I love the word 'vacation'. Right this minute I'm thinking it means "the act of vacating my mind of 'work', 'busyness', 'clutter', and especially 'ought-to's'. My British friends would say, "I'm ON HOLIDAY!" However you say it, I LIKE IT!!!! Years ago (when I was in my early thirties) I had some friends who talked about going on their vacation. It was going to be a splendid time at Disney World. They were going to stay at a fancy resort, and wine and dine, and play, and swim, and not have to make their beds, and just have a wonderful time in the Magic Kingdom and at my favorite place: EPCOT CENTER. I found myself so jealous. Seriously, I was green with envy. I did not enjoy their talking about their plans.... especially when they (she) talked ad nauseum about the chore of getting ready to go. Good grief ... for her. Good grief ... for me. I'm glad I'm older now and wiser. Anyway, now I'm on vacation... and though it is different than we thought it would be at the beginning of this week... it is WONDERFUL!!!!! 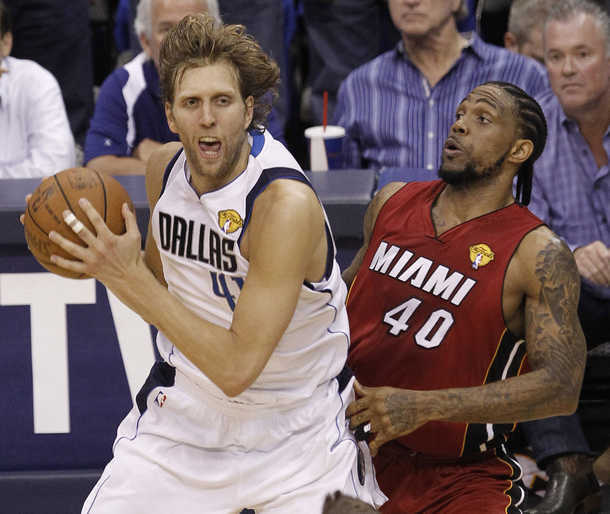 This picture was on the Star Telegram website this morning. That's a sick Dirk beating Miami Heat. !!!!! Great pictures already! I love the beach, its just so peaceful. The way I see it, I get to enjoy the beach with you by looking at these pictures. So far, no green monster. AND, what about that DIRK!!! Isn't he something! I hope he gets the rest he needs...I wonder if he would like some of grandma's homemade chicken soup with homemade noodles? I may need to give him a call later today. I'm jealous of your vacation, but not angry jealous. Just wwanting to be relaxing with you. Someday... ;) Have a great time! !